Thomas Francis Mankiewicz was born into a successful cinematic family on 1st June 1942, in Los Angeles, California. His father, Joseph (of German descent), was the successful screenwriter behind "All About Eve" and was already an Oscar winner by the time Tom was born. Joseph moved his family to New York on the birth of his son. The young Tom Mankiewicz attended Phillips Exeter School in New Hampshire and later, the prestigious Yale University in Connecticut, where he majored in Drama. Whilst studying he found work on a few token productions, including "Comancheros", the 1961 John Wayne western. By 1963 (aged 21), Tom entered the workforce full time as assistant to Lawrence Turman, the would-be producer of "American History X". Mankiewicz quickly made his name in the film industry as a jack-of-all-trades - his first credit coming as Production Assistant onboard the screen adaptation of Gore Vidal's theatre production "The Best Man" (1964). The film found favour with the critics and received an Oscar nod. Whilst the young assistant served his producer Turman well, his real passion and skill would be found as a writer. In the late 1960s, Mankiewicz began to work in his own time on a screenplay entitled "Please". The story of Tom's first screenplay was almost as tragic as the story it related - that of tormented, and ultimately suicidal actress - as his first draft was shopped around but never optioned. 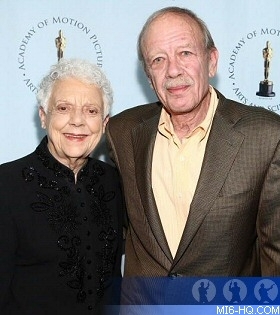 Above: Rosemary and Tom Mankiewicz attend a AMPAS' centennial salute celebration event for Joseph L. Mankiewicz in 2009. 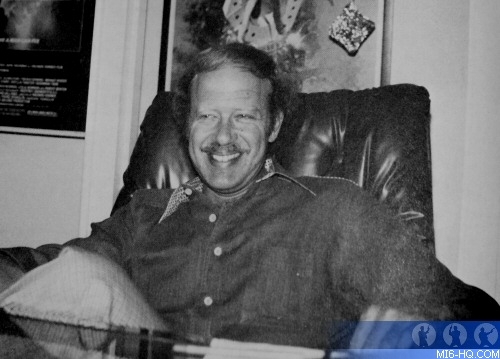 Beyond Bond: Hollywood screenwriter, producer and director; contributed to both the Batman and Superman franchises. His self-motivated work on "Please" ultimately won Mankiewicz his first writing gig, an episode of "Bob Hope Presents" which aired in 1966. It was rumoured that after seeing his name in the credits as "Thomas F. Mankiewicz" he insisted thereafter that he should simply be credited as "Tom". The next year Tom earned a job as the solo scribe on Nancy Sinatra's hour-long show "Movin' with Nancy" which also included cameos from some of the era's best-known music stars, Dean Martin, Sammy Davis Jr. and of course, Frank Sinatra. Years later the writer recalled fondly the time he worked on "Georgy Girl" the Broadway musical which was based on the 1966 film of the same name. Producer Fred Coe asked Mankiewicz to join the team that included Carole Bayer as lyricist and George Fischoff as composer. He had had experience with the Sinatra's one-hour television features but had never written a show. The production went on to great success at the Winter Garden Theatre, where it opened in 1970 and scooped nominations for three Tony awards. Above: Screenwriter Tom Mankiewicz behind his desk, c. 1974. It was through the success of "Georgy Girl" that Mankiewicz came to the attention of the James Bond family and he was offered his first job on a Hollywood film - co-screenwriting "Diamonds Are Forever". After attending the opening of his new show, Tom returned home to California, where, he related that his "agent called me and said, 'How'd you like to write the next James Bond movie?' And I said, 'It's not nice to be cruel, Malcolm.'" However, Mankiewicz's agent had just had a call from United Artist's David Picker. It turned out that "United Artists was having dinner with Cubby Broccoli in New York. Cubby said, 'Here's the deal: I need a total rewrite on "Diamonds Are Forever". I need an American writer and I want him to be young. Most of the picture takes place in Vegas. The Brits don't write people in Vegas well, but I need someone who can write in the British idiom and it's impossible.'" Shortly after having this story relayed to him, Tom Mankiewicz was given a two week option on the "Diamonds Are Forever" script. Two weeks later, Tom got the call of the lifetime. It was Cubby Broccoli asking him to stay on and complete work on James Bond's seventh adventure. Mankiewicz was hooked into the Bond family from that point onwards and did not depart for almost 10 years. Mankiewicz conceded "Diamonds Are Forever" was a challenging project but the young screenwriter was able to inject new life into the Bond series, penning some of the series' wittiest dialogue. The work met with the approval of Sean Connery who had been coaxed out of "retirement" for one last adventure. Sean held such a grip over the production that it was with nervousness that the 60-page draft by Mankiewicz was posted to Connery. The Scotsman gave it his seal of approval, asking how old the new screenwriter was. Mankiewicz recalled that "Sean started calling me Boyo. And he said, 'Tell the boyo to keep working.'" Many years later, "Boyo" was still what Sir Sean called his favourite 007 screenwriter. 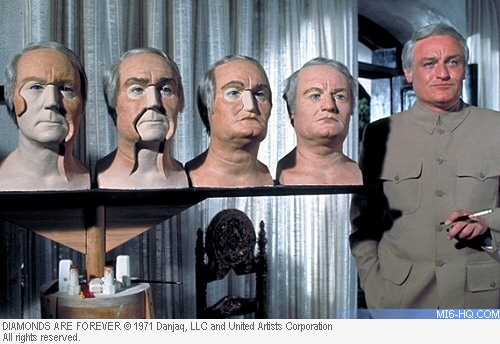 Above: Charles Gray as Blofeld in "Diamonds Are Forever". The screenwriter recalled that whilst he was able to please most of the people most of the time, often his scripted gags were too obscure for the producers' liking. "Charles Gray who was a very sophisticated feller and a wonderful actor playing Blofeld," recalled Mankiewicz. "At the end he's got Bond trapped on the oil rig and Bond says, 'Well, I guess you've won, Blofeld,' or something like that. And Blofeld says, 'As François Duc de La Rochefoucauld once observed, humility is the worst form of conceit, I do hold the winning hand,' And I wrote that and Cubby once again said, 'You what?' I said, 'La Rochefoucauld, Cubby, 17th century French writer.'" Broccoli responded with: "Get it out." From then on the producer started calling it 'the Nicklaus line.' "He'd call and say, is that Nicklaus line still in there? Guy Hamilton loved it and he shot it in the scene in such a way that it had to be in the movie because there was no coverage and Cubby got furious, and I mean furious like you know, really angry. He said, 'I told you guys that I did not want that Goddamn Nicklaus line in there.'" On the success of "Diamonds Are Forever", Cubby too was pleased with Tom's performance and even handed the reigns over to the 29 year old on "Live And Let Die", for which Mankiewicz took soul screenwriter's credit. 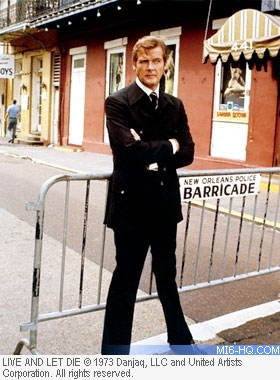 Mankiewicz began writing "Die" prior to the casting of Roger Moore. "The script was written and finished before Roger was cast. Having had the experience of 'On Her Majesty's Secret Service'," recalled Mankiewicz some years later, "United Artists was desperately concerned that the film be, above all, entertaining." Whilst fans are often divided on the substance and style of Moore's debut outing as Bond, the young Mankiewicz undeniably did a good job in his ushering in of Roger Moore - arguably the most successful actor prior to putting on the famous tuxedo. 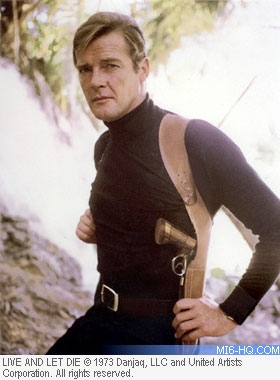 Above: Roger Moore - for whom Mankiewicz wrote his debut Bond screenplay, "Live And Let Die" . "The Man With The Golden Gun" reportedly left the screenwriter unsatisfied in hindsight but united Tom with Bond veteran writer Richard Maibaum. Whilst there was tension in the Bond family as Albert Broccoli and Harry Saltzman parted ways, Tom began working on some of his own projects. Mankiewicz co-wrote and produced the racy comedy "Mother, Jugs & Speed" (1976) and co-wrote star-studded drama, "The Cassandra Crossing" which featured Sophia Loren, Richard Harris, Ava Gardner and Burt Lancaster. Meanwhile, the 10th James Bond adventure - and the first to be helmed by Broccoli as solo producer - was undergoing script treatment. Various screenwriters had a hand in what would ultimately be dubbed "The Spy Who Loved Me" after Ian Fleming's novella, including Richard Maibaum, Christopher Wood, Ronald Hardy, Anthony Barwick, John Landis and Anthony Burgess. Mankiewicz was back in the fold as well to edit an early pass of the script before Wood and Maibaum came up with the definitive draft. Mankiewicz's final contribution to the Bond franchise came when he was asked to draft an outline for the far-fetched "Moonraker". In his element, Tom concocted a space-age plot that would be padded out by Christopher Wood and Lewis Gilbert, the director. The same year as "Moonraker" was unleashed on a space-crazed public, Mankiewicz retired from the Bond scene to focus on Sidney Sheldon's "Hart to Hart" television series. The 111 episode detective drama ran between 1979-1984 and Tom directed 13 of the episodes between '79-82 as well as penning its debut episode. The series was initially called Double Twist and created by Sidney Sheldon, but Mankiewicz overhauled the programme at the request of its producers, Aaron Spelling and Leonard Goldberg. Above: Tom Mankiewicz attends Richard Donner's screening of "Superman II" in 2006. In the 1980s, Tom Mankiewicz was responsible for reinvigorating Superman for the 1978 film. Richard Donner worked closely with his screenwriter to help shape the classic super hero for a more modern audience. Although the screenwriter was never credited as such, Donner credited Tom as Creative Consultant. 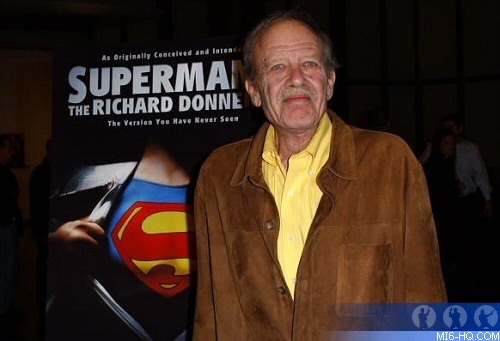 Mankiewicz worked again with Donner again on "Superman II" and much later, in 2006, on the directors cut, in order to piece together lost material from the second Superman film. Pleased with his work on "Superman", Warner Brothers nabbed the screenwriter in an exclusive deal that would see Mankiewicz become the creative consultant (or screenplay fixit) on a number of successful blockbusters, including "Gremlins", "War Games" and Tim Burton's "Batman" film. His final dabble as a producer was on "Hot Pursuit" (1987), which starred John Cusack and Jerry Stiller. The same year Mankiewicz worked with Dan Aykroyd and a star studded cast to direct his first motion picture, "Dragnet". The comedy, written by and starring Aykroyd was met with luke warm reviews but has become somewhat of a cult classic. Throughout his life Tom Mankiewicz has been active in the various filmmakers unions. In 2007 he supported his fellow writers in the WGA strike, saying, "I've never seen the guild with a more properly militant leadership. If we do this right this time, we won't have to do it again." Mankiewicz was also a race horse owner and keen horse racing fan, and was often seen at the Santa Anita and Del Mar tracks in Southern California. After a fight with cancer, Thomas Francis Mankiewicz passed away in Los Angeles, California, USA, on 30th July 2010. The prolific screenwriter was aged 68.